AUSTIN, Texas, Oct. 2, 2018 /PRNewswire/ -- As the cool fall weather starts to creep in, there will be quite a few sales heating up in October. 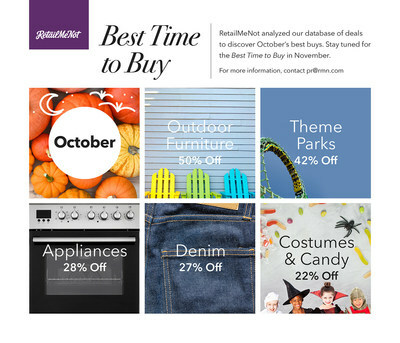 This month brings several opportunities for shoppers to save on all of fall's essentials. From outdoor furniture and denim to kitchen appliances and all of the scariest gear for Halloween, shoppers shouldn't hesitate to take advantage of some great savings on items they are sure to use this month. "This month is prime time for shoppers to stock up on some autumn items and potentially get ahead of some holiday shopping," says Sara Skirboll, shopping and trends expert for RetailMeNot. "Shoppers can use this month to update their fall wardrobe and get decked out in their favorite costumes, as well as get their homes and kitchens holiday guest-ready – while maybe checking off a few names from their holiday shopping list." Did the summer fly by without you purchasing outdoor accessories? Shoppers who waited are in luck, as October is a great time to shop for items like patio furniture and decor. With the outdoor season wrapping up, consumers can find the best prices now before it all clears out before the holidays. Roller coaster rides may evoke the feeling of summer, but many theme parks are open year-round or close only during the cold winter months. The weather in October is still perfect for enjoying outdoor rides, and it happens to be a lull period for most theme parks. Look for big savings and big fun! Straight-leg, low-rise, skinny or boyfriend: Whatever denim pleasure shoppers prefer, it will be on sale this month. October is a great time to stock up on one of fall's biggest staples. This autumn essential has already been flying off the shelves for back-to-school shoppers, but there's more where that came from. As the cool weather approaches, retailers are starting to discount them and to make room for all of the fall and winter fashions to come before the holidays. When October comes to mind, so does the sugar-fueled madness of Halloween. Between candy for trick-or-treaters and costumes for the family – including those for four-legged friends – the costs can really add up. Shoppers will see the deepest discounts on costumes and candy in the week leading up to Halloween. Retailers want all their inventory gone before the holiday passes — after all, what good is orange-and-black candy at Christmas? While shoppers may not have the best selection that week, they can still snag festive costumes and décor with a discount. Holiday gatherings are right around the corner, which makes October a great time to get your home ready for guests. Sales on big appliances started in September, but they continue into this month, ensuring that everyone can be a host with the most. Retailers are slashing prices now to make room for inventory on Black Friday and beyond. Shoppers prepping for a large family meal should make sure the kitchen is ready for action and take advantage of sales on items like Keurig coffee makers, microwaves and other small kitchen appliances as well.